Eclipse, part of Capita Plc, is the leading provider of Case Management software for firms operating in the personal injury sector. 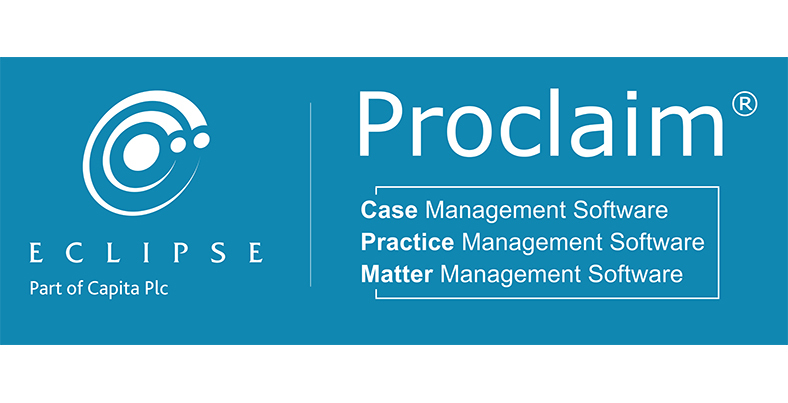 Our Proclaim solution is Endorsed by the Law Society. In total we have 25,000 users across the entire sector, including claimant and defendant law firms, accident management companies, Alternative Business Structures, insurers, medical reporting agencies, and costs drafting firms. Proclaim provides a complete Case Management solution integrating data storage, document production, workflow, task management, reporting, financial analysis, and links with suppliers. As standard, Proclaim integrates via ‘A2A’ with the RTA and EL / PL claims Portals. Proclaim is also the system of choice for Alternative Business Structures (ABS) operating within the personal injury sector. Our solution, Proclaim ABS, is unique in the marketplace and is the ONLY system that integrates claims management, personal injury litigation and medical reporting within one single Case Management solution.